360SDM is proud to mill high precision custom made abutments and components for preferred partners, small local labs and the dental market. Medentika Implants are manufactured with precision and without compromise. They fulfill our customers’ highest requirements of quality, compatibility and durability. As this quality results in extremely low complaint rates we can provide wide-ranging warranty and conditions. 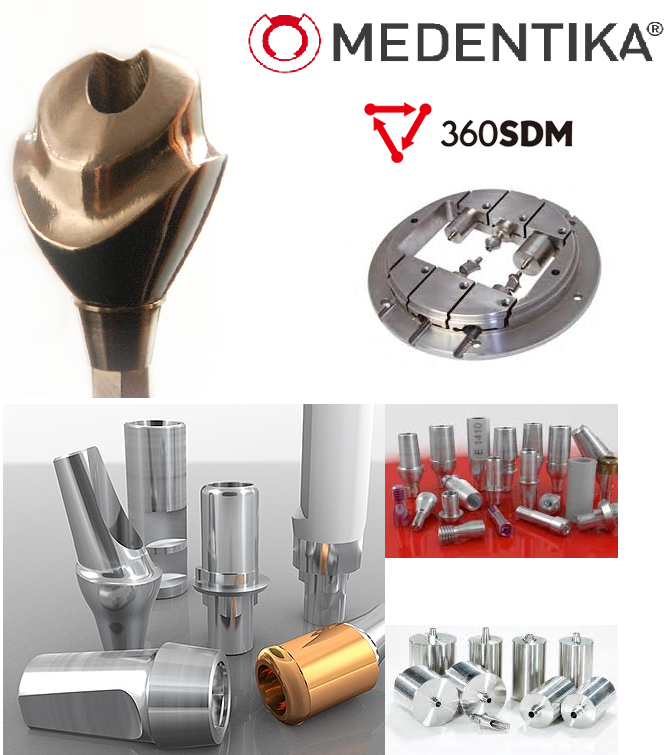 Medentika not only assumes responsibility for the quality and durability of abutments manufactured and supplied by Medentika for 30 years but also provides a limited warranty on other manufactured implants used with the abutment. This extension of the limited warranty primarily takes effect if other manufactures limit the warranty of their implant because it has been combined with an abutment from Medentika. Components from Medentika will help provide a sound foundation for your restorations. In addition, our quality-trained employees are available to dentists and dental technicians globally free of charge-for all matters relating to Medentika but specifically in the case of technical complications. We meet the highest standards and maintain the norms, in addition our products are uncompromisingly precisely manufactured. They take into account all the requirements of our customers in terms of quality, compatibility and durability. Medentika exclusively uses cold formed grade 5 titanium which has significantly higher tensile strength compared to normal grade 5 titanium. Medentika has character and it is this character that gives us a morally sound base. In a world that is becoming more and more focused on the laws that drive the market forces, we feel that this position is not only right, but important. What characterizes Medentika is also our belief in the power of our ideas and in the innovative power in our products. We are Medentika: and if the Medentika label is on the packet, there is more than just an implant component inside. But an implant component that bears the knowledge and the experience that we are putting into our products since Medentika was founded. We offer our customers our enthusiasm: a feature we use to perfect our products on a daily basis. We take this task seriously but we also try to embrace it with passion. The result is a product manufactured with the highest interface precision for an extremely wide range of prosthetics. We (Medentika) believe in ourselves so much that we are willing to offer a 30-year warranty on the abutment, screw and the implant used with Medentika Abutments.